Dorothy Hamill inspired my generation to be skaters…and to cut our hair. If you grew up when I did, you probably loved ice skating. You were probably transfixed by the 1976 Winter Olympic Games, when Dorothy Hamill won gold-yes, but also our hearts. Like me, you probably got a wedge haircut so that you could look like Dorothy Hamill (and you probably learned, like me, that not everyone with a wedge haircut will pull it off like she did). If you grew up when I did, you probably saw-and loved-that romantic movie with the bratty figure skater and the angry hockey player…Cutting Edge! Remember it? (Dreamy sigh!). If you grew up where I did, in New Hampshire, you probably lived for snow days, and loved winter, as I did. If you were lucky, you grew up in or around a family like the Trowbridges. My friend Bea’s family were natural athletes who loved nothing quite so much as shoveling the snow off Dublin Lake in search of the coveted “black ice” that sounded so dangerous but was, they assured me, the holy grail of smooth, safe skating. The Trowbridges could skate backwards and pull off figure 8’s and grab hockey sticks for a quick multi-generational match. Except that I was not. 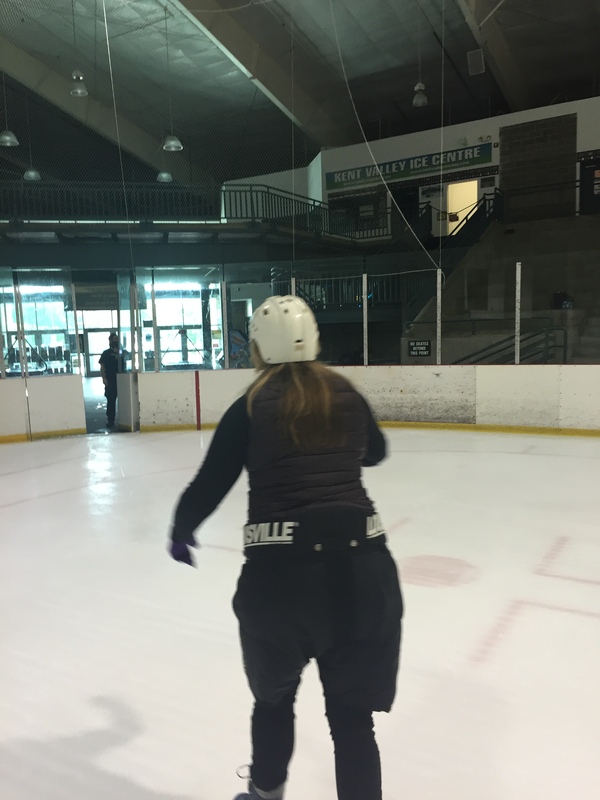 The problem with saying, at 50, that you want to ice skate even though you’ve never been able to, but time’s a wasting and you want to overcome your aversion and fear and sense of defeat and just do it; is that the falling thing is a bigger deal. For instance, I didn’t ice skate the whole first year of Facing 50 Fears because I was training for the (damn) marathon (#42 Run a Marathon). One fall could mess me up and after painstakingly adding miles each week to get to 26.2, there was no way I was going to start over. So instead, I avoided the fears on my list that seemed fraught with the chance of injury, like ice skating (and #23 Downhill Skiing, and #9 Ride a Bike, and #15 Climb a Big Mountain). Since all I’d ever done on the ice was fall, I had to be prepared. I decided to throw my pride and vanity to the wind. Rod produced some hockey pants-big clownish things that easily add 20 lbs to the look of your backside. If he meant them as a joke, he must have been surprised when I pulled them on and declared that, yes, these bad-boys would do nicely. Fun fact: Hockey pants feature actual tail bone protection. Good deal! I also wore a helmet. When we picked up our rental skates I noticed a wall of helmets and thought, “good idea”. The employees at the Kent Valley Ice Arena were hard-pressed to find me an adult helmet, but find one they did. Did it look ridiculous? Yes. Did I care. Nope. The rink was populated with figure skaters. Little girls holding hands. Teenage girls speeding into spins. Pop music played over the speakers. There were no 13 year-old boys careening around the edges. No wobbly seniors hoping not to be knocked over by a newbie. I walked from the rubber rug onto the ice. Yes, it was instantly slick and cold and menacing. That’s when my skate tip bit into the ice. I stumbled. The ice seemed to come up to meet me. My knee smashed onto the surface. Ouch. A rear-view of the hockey pants. Lovely! “You’re doing a good job, Mom. You fell. No biggie.” Hugh’s tone was pure kindness. It surprised me. He is 15, after all. The tricky thing about being 50, and wearing hockey pants is that it makes getting back on your feet really tricky. I thought about the figure skating moms, sitting in the stands, watching me. How stupid I must look right now. I had to crawl over to the wall. Hugh was there, but he wasn’t steady enough to help me. I had a feeling I was about to join the ranks of Carol Burnett and Penny Marshall. Getting up from this ice might just count for #27 Perform Stand Up Comedy. But then Rod came along, helped me up, and spared me the ice splits, wall hugs, and blade twists that were tumbling through my imagination. Once I was up, I stayed up. I wasn’t figure skating. I wasn’t doing figure 8’s. But I wasn’t perpetually falling either. One of the figure skater moms gave me a thumbs up. Sweet! Around I went until the music stopped and they announced that the skating session was over. I was sweating…probably from nerves as much as work. And…I was smiling. It was so much fun! I faced my fear of skating, and like #32 Eat an Oyster, I think I found something that I not only can manage, I’m actually up for another round.